Finest category of a gourmet extra virgin olive oil infused with 24-karat edible golden ﬂakes. 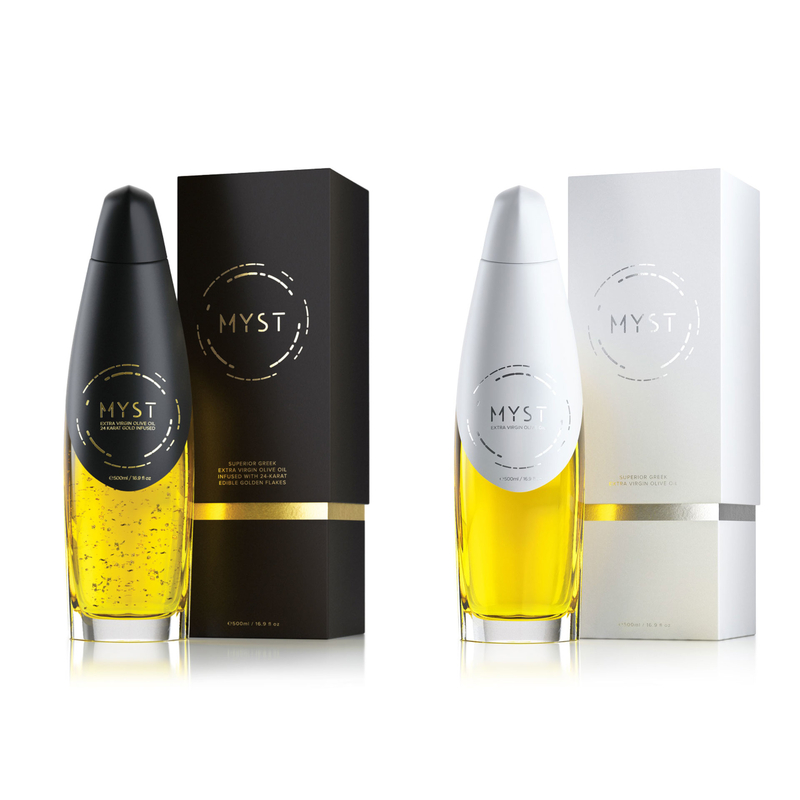 MYST® GOLD contains 500 ml extra virgin olive oil, cultivated in the historic olive groves of Olympus. MYST® PURE contains 500 ml gourmet extra virgin olive oil, cultivated in the historic olive groves of Olympus. Ever since the times of Pharaohs in 2000 BC, gold has been considered as food able to win the favour of Gods. According to the ancient alchemist concepts, gold possesses legendary powers which contribute to a long and vital life. Olive oil is often referred to as "liquid gold." So to emphasise the point, MYST® added 24 karat edible golden ﬂakes from the ﬁnest varieties. *Eatable gold as a food supplement is listed as E-175. MYST® extra virgin olive oil contains aromas of herbs, citrus fruits and ﬂoral hints with remarkable length while being exceptionally balanced. MYST® extra virgin olive oil is produced by the method of ﬁrst cold extraction at low temperatures under closely monitored hygienic conditions. We stayed true to the words ‘extra virgin’ by steering away from using any chemical fertilizers or pesticides at any stage of the production. *Storage in cool and dark place. Bergamot is one of the most traditional sweet spoons, for many it is the most aromatic and finest with a clear color.